Freesia Bulbs Growing Tips Freesia flowers are “zygomorphic” which just means that they grow along one side of the stem, in a single plane. When you look at a flower stalk however, you'll see that the blooms are facing upwards. How does this work? Freesias stems have the unusual habit of turning at right angles just below the bottom flower. This causes the upper portion of the stem to grow almost parallel with the ground. 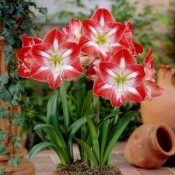 The flowers bloom along the top side of the stalk, facing upw..
Gladiolus Bulbs Care Tips A classic cut flower, gladiolus produces tall flower spikes adorned with large, showy flowers. Often relegated to the cutting garden, gladiolus also suits the back of the border where the tall flowers can complement bushier plants. About This Plant Gladiolus are available with flowers in a huge range of colors, including apricot, blue, burgundy, pink, gold, red, orange, and white, as well as multicolored varieties. The plants bloom in midsummer; however, you can prolo..
Gloriosa Red Bulbs Growing Tips True lilies belong to the genus Lilium and grow from plump, scaly bulbs. They are magnificent flowers that command attention wherever they are planted. Lily flowers are valued for their very showy, often fragrant flowers. The 6 plain or strikingly marked tepals ("petals") are often trumpet-shaped, sitting atop tall, erect stems. At home in both formal and naturalistic settings, lilies also most take readily to containers. They all make wonderful cut flowers. 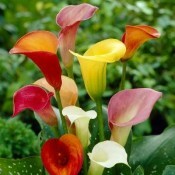 By ..
Gloxinia Tubers Growing Tips True lilies belong to the genus Lilium and grow from plump, scaly bulbs. They are magnificent flowers that command attention wherever they are planted. Lily flowers are valued for their very showy, often fragrant flowers. The 6 plain or strikingly marked tepals ("petals") are often trumpet-shaped, sitting atop tall, erect stems. At home in both formal and naturalistic settings, lilies also most take readily to containers. They all make wonderful cut flowers. By car..
Ixia Bulbs Growing Tips If you need a colorful addition to a flower bed that gets hot afternoon sun, you might want to try growing Ixia bulbs. Pronounced Ik-see-uh, the plants are commonly called wand flowers, cornflowers or African corn lily plants. Ixia wand flower thrives in the hottest and sunniest areas of the garden, producing attractive, sword-shaped foliage and masses of dainty, star-shaped flowers on wiry stems. Growing Ixia Bulbs When growing Ixia bulbs, actually corms, you may be ha..
Kaempferia Lily Bulbs (Pack of 3 Bulbs)..
Lilium, Panther Lily Growing Tips True lilies belong to the genus Lilium and grow from plump, scaly bulbs. They are magnificent flowers that command attention wherever they are planted. Lily flowers are valued for their very showy, often fragrant flowers. The 6 plain or strikingly marked tepals ("petals") are often trumpet-shaped, sitting atop tall, erect stems. At home in both formal and naturalistic settings, lilies also most take readily to containers. They all make wonderful cut flowe..
Lillium Growing Tips True lilies belong to the genus Lilium and grow from plump, scaly bulbs. They are magnificent flowers that command attention wherever they are planted. Lily flowers are valued for their very showy, often fragrant flowers. The 6 plain or strikingly marked tepals ("petals") are often trumpet-shaped, sitting atop tall, erect stems. At home in both formal and naturalistic settings, lilies also most take readily to containers. They all make wonderful cut flowers. By carefully b.. Growing Guide Convallaria (Lily-of-the-Valley) Delicate, pendant flowers of Lily-of-the-Valley line up along gracefully arching stems in mid-spring. The white or pink blooms are small and waxy, with a cherished fragrance that is irresistible; if you pull up gently on the stems, you will have lovely, long flower spikes to enjoy in a vase, preferably at nose level. Easily grown, these small plants will take a couple of years to establish and may not flower the first year. 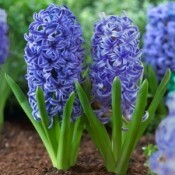 But their creeping rhizo..
Muscari Bulbs Growing Tips How to Plant Grape Hyacinth BulbsLoosen the soil and remove any weeds, competing roots and stones from the area you plan to plant. Plant the bulbs in groups of ten or more, and be sure to set the bulbs twice as deep as they’re tall, at least a couple of inches apart. Leaves will show up quickly. Just ignore them. Grape hyacinths send their leaves up out of the ground in the fall. This is strange because it’s just before winter comes and you would thi..
Oranthigalum Bulbs Instructions Bring a touch of Africa to your yard with the brilliant orange Ornithogalum dubium. Commonly called star of Bethlehem, orange star flower, snake flower or chincherinchee, this South African bulb is hardy in U.S. Department of Agriculture planting zones 7 through 11, and can be enjoyed as a tender bulb or a potted plant elsewhere. The plant grows up to a foot tall and blooms with clusters of 15 to 20 small six-petaled blossoms on 12 to 15-inch stems in spring. Ora..
Ranunculus Bulbs Instructions You can add big color to the garden on a small budget when you plant ranunculus. Most of the roughly 600 species in the genus Ranunculus, including buttercups, are herbaceous perennials that yield white or bright yellow flowers. They grow in U.S. Department of Agriculture plant hardiness zones 8 through 11. Although you can grow them from seed, ranunculus are typically grown from tubers that look like bunches of tiny, dark bananas, available inexpensively by the ba..
Sparaxis Bulbs Growing Tips Growing Sparaxis Bulbs The harlequin flower is the most outstanding of its genus, Sparaxis, making very popular garden subjects. The genus of 6 species is among the most spectacularly patterned and colored bulbs native to South Africa. It is said that the effect of looking at a group of Sparaxis, or harlequin flowers, is like looking into a kaleidoscope. Growing from corms, harlequin flowers have sword-shaped leaves and tapered flower spikes of star-like florets in ..
Spider Lily Bulbs Growing Tips True lilies belong to the genus Lilium and grow from plump, scaly bulbs. They are magnificent flowers that command attention wherever they are planted. Lily flowers are valued for their very showy, often fragrant flowers. The 6 plain or strikingly marked tepals ("petals") are often trumpet-shaped, sitting atop tall, erect stems. At home in both formal and naturalistic settings, lilies also most take readily to containers. They all make wonderful cut flowers. By c..
How To Grow Tuberose, Rajnigandha Bulbs: Plant tuberose bulbs in spring when frost is past. Place the Bulbs 3 to 4 inches deep and 5 to 7 inches apart. Soil Shoul be well drained and pick sunny spot for best germination, well tuberose bulbs likes hot afternoon sun. Keep the soil consistently moist before and during the period of bloom that occurs in late summer. Enrich poor soil with compost and organic amendments to increase drainage and texture for the best show of tuberose flowers. Best resu..
Zephyranthes Light Pink Bulbs - 6 Bulbs..
Zephyranthes Pink Bulbs - 6 Bulbs..
Zephyranthes White Bulbs - 6 Bulbs..
Zephyranthes Yellow Bulbs - 6 Bulbs..
Zephyranthes Mix Bulbs - 6 Bulbs..